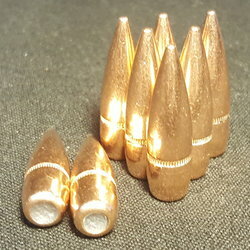 Home :: PROJECTILES :: .38/.357 CAL (.357) 125gr FP 100 ct.
.38/.357 CAL (.357) 125gr FP 100 ct. 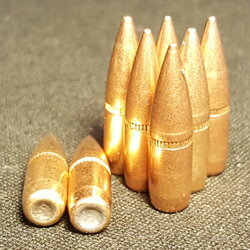 These bullets are swaged and plated to final weight and re-struck for accuracy and precision. .223 CAL 62gr FMJ Projectiles 100 ct.
.308 Cal 147gr Jacketed Pull-Downs 100 ct.
.38/.357 CAL (.357) 158gr FP 100 ct. I am a regular customer because I always get outstanding service with fast delivery. 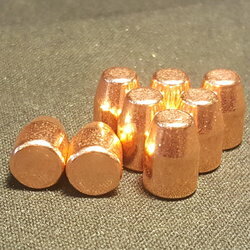 Having picked up a lot of range brass over the years and cleaning it myself, it is most pleasant to open up an order from Diamond K and seeing bright and shiny ready to reload brass right out of the bag. Customer service, quick shipping, clean brass, all these describe receipt of any order from Diamond K. Economics, almost forgot that one as folks can make calculations to be sure and can find perhaps cheaper elsewhere but seriously doubt one will find it cleaner or better sorted. I would rather have it like this as opposed to dumping an order of "range brass" into a tumbler and having to do it myself. Very prompt shipping. The brass was in great shape and only found one bad case. 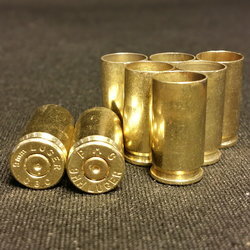 I recieved extra brass to cover the bad casings. will be sending in another order. Told all my friends .Great prices. I have never had a problem ordering from Diamond K....and that is why they are my first choice when I need brass. Good products and good service! This is the only place where the all of the brass is usable and I mean all. I ordered 200 and got 210 usable brass. And it's a good price.